Giza Pyramids complex is located on the Giza plateau. It includes the three master Pyramids, which are ((Khufu, Khafre, and Menkaure)), the superb Sphinx, some cemeteries, and an industrial complex. It is located in the desert of Giza in the southwest of Cairo. 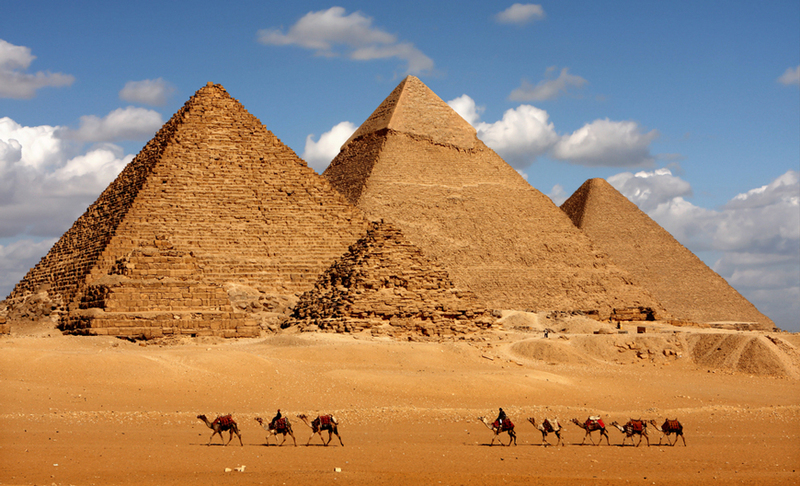 The Giza Pyramids are listed as one of the Seven Wonders of the World. Millions of different guests visit them every year, check our Egypt holiday packages if you prefer to book a breathtaking vacation. They reveal the great heritage of the ancient Egyptian Civilization. Let us take a moment now to explore the glory of this unique civilization. Giza Pyramids complex consist of the Great Giza Pyramid of Khufu or “Cheops”, the Pyramid of Khafre or “Chephern”, and the Pyramid of Mykerinos. It is the oldest and largest Pyramid among the whole Giza Pyramids and it is considered one of the most ancient Wonders of the World. It belongs to King Khufu from the 4th Dynasty. It took about twenty years to be built. It contains three rooms, two of them belong to the King and the Queen. There are also two temples to honor the King. It consists of 2.3 million building blocks, which makes it really a unique masterpiece from the time of the amazing ancients. This great pyramid was once called Khufu’s Horizon. It has concave sides and passages to go up and down which makes it unique and one of its kind. If you found yourself in Cairo and want to witness the Pyramids of Giza in a short time, then check our Cairo tours it’s will help you to achieve what you need. It is the second largest pyramid in Giza Pyramids complex, which belongs to King Khafre from the fourth dynasty. It was explored in 1818 by Giovanni Belzoni when he found the main entrance, where he was hoping to find an intact burial but unfortunately the room was empty. Then John Perring had his complete exploration in 1837. It is located in the east side of the pyramid of Khafre, it was built by local limestone and was used for the purification and the Mummification process of the mummy of the kings. It has been buried under the desert sand until the 19th century. On the south side of the pyramid, you can find a satellite Pyramid, it has two main passages one of them has a dead end with a niche that has some ritualistic furniture. It is the most interesting monument from the ancient civilization as it has a relation with the ancient Greek mythology of the sphinxes that were sent by gods over the towns of Thebes to punish those who commit crimes. The Giza Sphinx is a mythical creature with a head of a man “Khafre’s” and a body of a lion that measures 73 meters long and 20 meters high. King Khafre was the one who ordered to build the Sphinx to guard the Pyramids in 2500 P.C. His nose was destroyed by a Sufi Muslim, Muhammed Sa’im al-Dahr in the 15th century not by Napoleon during the French revolution. There are some interesting things about the Sphinx, it’s the ancient Egyptians were the first to imagine such a magnificent creature, a Sphinx is a creature that has a face and a breast of a woman, a body of a lion, and wings of an eagle. Another astonishing thing about it is that it was colored before. Its face was in red and its body was in blue and yellow. Giza Pyramids complex were built to house the remains of the Egyptian pharaohs who ruled during the period of Ancient Egypt. The ancient Egyptians believed that death is just the beginning of a journey to another world. They tried to prepare themselves for such an experience by building the magnificent Giza Pyramids complex. The ancient Egyptian pharaohs prepared their tombs with their own things believing that they will return to life again as kings, that’s why their tombs, temples, and burials were full of priceless monuments, and Trips In Egypt give you the chance to explore these wonderful facts during your Egypt tour packages. While we have the three main Giza pyramids Khufu, Khafre, and Menkaure, there are other 130 pyramids that have been discovered around the area of Ancient Egypt. About 100,000 workers have engaged in moving the stones of the great pyramids (slaves and paid workers). All pyramids are suited on the west bank where the sun sets every day, which symbolizes the realm of the dead. No hieroglyphics or writing is found inside the great Giza Pyramid, which leaves many questions. The Great Pyramid was actually built as a tomb for Pharaoh Khufu. About 144,000 casing stones were used in building the Great Giza Pyramid that was extremely flat. In order to build the pyramid that covers more than 13 acres of land, they used about 2.5 million giant blocks of stone.